The Chicagoland region “underspends on transit operations and capital” compared to peer cities, and the “region’s economic competitiveness will suffer” as a result, according to a recent analysis by the Metropolitan Planning Council [PDF]. The report takes a look at Metra, the CTA, and Pace as a collective system, comparing it to transit networks in 17 other regions. Low funding results in transit service that can’t keep up with the growing population. Chicagoland’s increase in transit service is “lower than that of any comparable large U.S. region,” the report says, according to three service metrics tracked by the Federal Transit Administration’s National Transit Database. Chicagoland has an old rail transit network, so it’s reasonable to compare these service metrics in our region to similarly old transit systems, like Boston, New York City, and Philadelphia. Those regions “have funded far larger increases in transit mileage” — a measure of how much ground trains and buses cover — between 1991 and 2011, MPC reports. 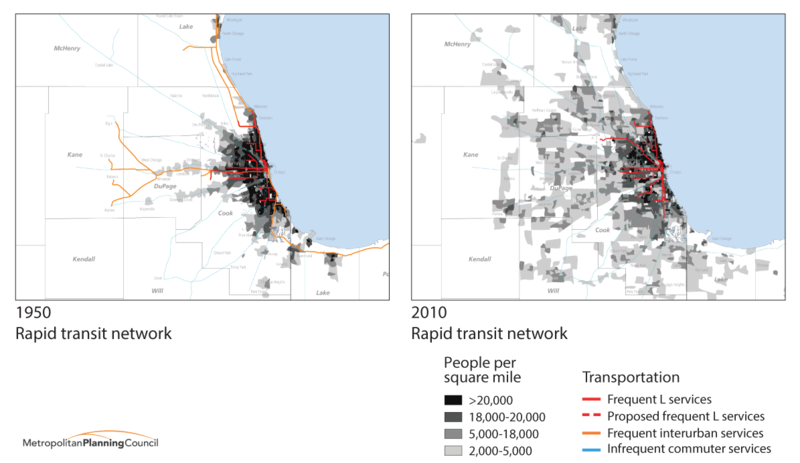 Transit mileage increased by 17 percent in that period in Chicago, while the other old transit systems added between 31 and 40 percent. MPC says Chicagoland transit ranks last among these cities for increases in the number of vehicles operated and total service hours as well. The report says in no uncertain terms that “the Chicago region has failed to expand its offerings… a direct result of a lack of adequate funding.” How would riders benefit if the region decided to catch up to similar cities? The report says that providing more funding for transit would mean “more frequent buses and trains on popular routes” and “maintaining service on lines through transit-dependent neighborhoods.” Frequent service leads to more riders, MPC says, because it means a bus or train is there when they need it. Cutting service, as those who lobbied CTA to keep the 11-Lincoln bus, including a vehement Alderman Ameya Pawar, can attest, means many residents lose a vital lifeline to their city. Chicagoland’s meager transit budgets limit the frequencies of Metra trains and their hours of operations. MPC recognizes that freight trains can conflict with Metra operations, but that doesn’t explain why the Metric Electric, which has passenger-only tracks, runs “once an hour at middays and on weekends to most destinations.” This pattern works fine for rush-hour commuters going to downtown Chicago, but that pattern is rapidly becoming less common. People are working alternative hours, the report says, and there are growing populations of youth and elderly residents and people traveling for personal reasons. Finally, most jobs are not in downtown Chicago. Transit service needs to change to match where people live and work. Paris, a similarly-sized metropolis, has much better suburb-to-suburb rail and bus connections, which run at high frequencies all day and during weekends. MPC notes that New York City and Toronto are “quickly developing round-the-clock frequent services on their commuter rail lines.” Chicagoland has actually regressed: A map in the report shows that in 1950, frequent service reached further into Chicagoland from downtown than in 2010. And while 82.2 percent of Chicagoland jobs are in reach of transit, “most of that access is provided by slow and infrequent bus service,” MPC writes. The less transit service available, the less people will ride. Chicago has fewer transit riders per capita than the regions of New York City, Montreal, Toronto, Vancouver, San Francisco, Washington, D.C., Boston, and Philadelphia. Why are CTA trains seeing more riders, but not buses or Metra trains? MPC says it’s because people require — and respond to — the frequent service CTA ‘L’ provides all day and on weekends. I don’t know if CTA has lower operating costs than its peers and this wasn’t discussed in the report. It’s important to understand “farebox recovery”, a budget function by which the state mandates that Chicago Transit Authority (and Metra and Pace) get 50% or more of its operations funding from fares. The CTA exceeds this; last time I checked it was about 56%. This puts CTA ahead of most of its peers. The report is meant to serve as an “existing conditions analysis” and provided no explicit recommendations, but it essentially says “we don’t fund transit enough to grow ridership and increase service like our peers do”. Surprising to see Barcelona in the mix. Since I spend a good 4 months out of the year overthere, I know its public transport system reasonably well. TMB (Transports Metropolitans de Barcelona) offers service far superior to the CTA’s, and a ticket (if you purchase a 10 ride card) costs less than half. Yet they’re even less funded than CTA. Labor costs in Barcelona are probably lower than Chicago’s, and they don’t have our lovely climate, and their train system is completely underground, on rocky ground that is—that may all make it cheaper to run. Barcelona also has an electrified regional transportation system (Rodalies) and a state train system (Ferrocarrils de la Generalitat) that goes pretty much anywhere with great frequency during all times of the day. All systems are being expanded as we speak. But I try to frame it this way: Chicago is kind of like the “capital” of the Midwest, no? The Midwest’s population is over 60 million, which makes it similar in population to Western European countries. And while the area spread is much bigger, like you pointed out, Paris’ metro region (the grand couronne?) is about as large as ours. And London’s is even bigger, if I remember correctly, but it’s nicely connected. And they keep getting better! Just a thought. Maybe if more of the cities in the region were connected by better, faster intercity rail we would think of it more as a “region,” but states (like post-2010 Wisconsin) make that kind of cooperation difficult. Inner Metra services need to be run like the “L”. This is clear from the map. Not to mention – then what’s the excuse for NYC’s incredible transit system? •Clybourn, Irving Park and Jefferson Park: There’s not much to do in these neighborhoods. Jefferson Park is a major transfer station, and Irving Park is a perfectly nice neighborhood if you walk a few blocks, but I can’t picture frequent travel to any of these places outside of rush hour. Irving and Jefferson are next to the Blue Line but obviously the Metra gets downtown much faster. •Norwood Park, Edison Park and Park Ridge: These neighborhoods have a lot of strong human connections and could benefit from more frequent public transportation. But they don’t really have enough density to justify it. The CTA runs a fairly frequent Northwest Highway bus that connects these stations to each other and Jefferson Park. •Des Plaines, Mount Prospect, Arlington Heights, Arlington Park, Palatine: These are all suburban downtown areas (except Arlington Park) which have been developing recently and might benefit from more frequent transit. But they’re still largely bedroom communities, and I’m not sure who would be using it during week days. There aren’t many jobs near these stops, and there aren’t good bus connections to where the jobs are. Arlington Park Racecourse would benefit, especially if the abysmal Sunday service improves. Suburbanites might also take advantage of later and more frequent service to visit Logan Square and Wicker Park via the Blue Line transfer at Jefferson Park. •North of Palatine: Exurban area with very low density. There are a couple small, mostly historic downtowns (Crystal Lake’s is growing a little bit), but I can’t think of a reason to increase frequency out there. I left out a couple stops that are basically parking lots for commuters. Running more and later trains as far as Palatine might have a small and debatable benefit at first, and then larger dividends as development follows. But the local communities would kill it long before then. Did I mention the trains run at-grade north of Jefferson Park and stop traffic every time they pass? Not sure how I feel about the at grade crossing around Harlem, Devon, Nagle, Bryn Mawr. Might a great idea, but as trains currently have the priority (I think) over cars then it might be better spend any available funds on different projects for now. Eventually it seems like it would be a good idea to lay tracks under the road at congested points. CTA’s operating costs are in line with peers. I’ll second you in that we don’t have a diverse enough funding pool for mass transit in IL. What I’d love to see is a merger of the IL Tollway and the mass transit agencies where the tollway can help subsidize mass transit. Regarding Jefferson Park, I’d like to see Metra treat that stop like they do Clybourn – virtually all trains stop there. Jefferson Park is an incredible multimodal hub with 12 CTA and Pace bus routes in addition to the Blue Line. It is among the highest ridership stations outside of downtown. If Metra ran more frequent service, it could tap into a larger underutilized market of transit riders on the NW side just by using existing CTA and Pace services. Metra should also do this on the UP-N line at Davis St. and the UP-W line at Oak Park. My previous articles have focused on how job centers are no longer in the downtown core. This report reiterates that fact when it says that most jobs are not in Chicago. Is Metra service allowing people who live in Chicago or along the UP-NW line to access jobs in the suburbs you mentioned? I don’t know these suburbs or the line as well you as but I have a friend whose story about accessing a job in Lake County is likely one experienced by many others: taking one outbound run in the morning would cause her to wake up pretty early and arrive to work 45 minutes early. If she took the next outbound run, she would arrive to work 15 minutes late. What’d she choose instead? Drive. Not everyone is so fortunate to afford a car and the long drive to work. An increase in service in response to Chicago’s changing job patterns increases the education and job opportunities. I feel a merger of the Tollway with any other agency would be resisted by the governor, the CEO, and legislators. They seem to run a very tight ship and they’re completely self-funded with high credit ratings. Any merger may harm this. Notice how they’re not involved with constructing the ill-conceived Illiana Tollway. There are a good amount of northwest suburban jobs, but most of them are still out on corporate campuses, where the trains stop in the downtown entertainment districts and the bus service between the two is lousy to nonexistent. A few jobs are moving closer to the stations but it’ll be a while. Not weighing-in on the topic of merging multiple agencies, but rather an underlying issue . . . Revenues generated from road pricing must include a mandatory transit revenues share – even those collected by ISHTA. Transit is the best way to reduce congestion and make roads safer, yet we do not have a viable transit network. Instead, we build ever-increasing amounts of road capacity. IDOT does it. ISHTA does it. Maybe some PPP combination with either of the two above will do it. Who is building major transit projects? Oddly enough, though, the multi-million dollar studies that justify building ever-increasing highway capacity include incorporation of transit elements so that project scoring can be boosted by the associated benefits. But then what happens to the transit elements? For example, where is the transit element promised as part of the I-90 project? Is it in the GoTo 2040 update now working its way through the approval process? Ummm, no. Maybe some sort of express bus is in there as a operational improvement, but nothing that rises to the level of a genuine commitment to reliable and efficient transit, as studied. Well, there isn’t any money to build or operate it, yet the road is getting built/expanded. The highway agencies – both IDOT and ISHTA – need to be accountable for delivering the transit benefits they claim in producing their analysis that supports making their ill-advised investments in the first place. As it stands, they simply defer to transit agencies knowing full well that the transit agencies have no money. Thus, study recommendations be damned: we only build the highway element. Unethical placaters. Bait and switch. Swindlers. Grifters. Where’s the accountability? Where’s the transit? The only way to close the gap is to make certain we can fund needed transit investments. The only way that will happen is if we change the way we earmark revenue sources. ISTHA is building park and rides at some of the interchanges, I believe, but I haven’t seen any designs or statements from ISTHA or Pace about the operations of the managed lanes or bus routes that might use the managed lanes. The absence of a statement is a statement . . .
That document is missing a lot of context, specifically a date published and who wrote it. Sorry(?) for resurrecting this thread but I could use an important clarification. 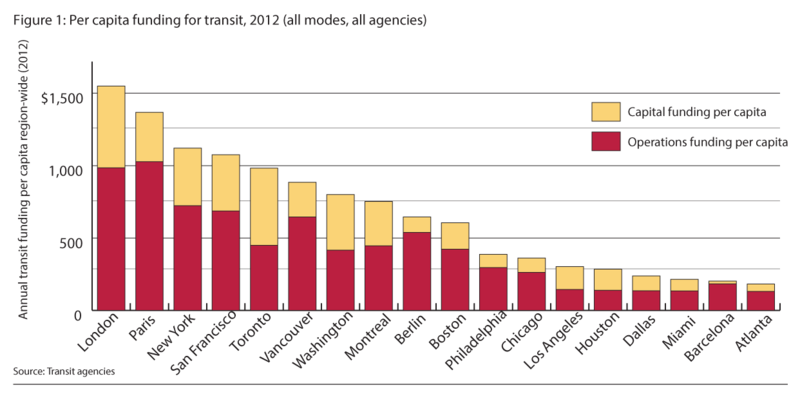 The chart at the top of the article shows per capita funding for transit. The low number for Chicago is supposed to show that Chicago residents pay less per person that people in other cities. On the one hand this is true. But in order to to properly interpret this chart you need to understand how much transit service each city has: how many miles of routes and how many hours of service, for example. In other words, other cities that pay more per person may get more service for their money. Does anyone know if there is readily available data that answers this type of question: the per person funding level vs. service miles and service hours? It would be insightful to know how Chicago compares to other regions given this consideration. I believe I adequately showed how Chicago compares to other regions, but agree that this chart doesn’t show that comparison. You’ll find additional charts in MPC’s report that, put together, will visualize the comparison. It concludes that other regions saw ridership increases track well with transit expansion and more investment. Our ridership grows slowly because we expand slowly because we spend so little money it. I attached one to this comment that shows the “change in total transit revenue miles” by region from 1991-2011. Chicago had the smallest change. Thanks for responding! I saw this chart in the MPC document as well. Still I feel like it doesn’t get to the question I am after because I am after gross revenue miles rather than percent change. To construct this graph one needs the gross numbers, and I guess I could pull these numbers of the NTD. I guess if I am really dying to figure this out I will. Beware some of the data is hard to read and not presented for easy analysis. http://nycbusroutes.com/index.php Bus – Washington Heights to Greenwish Village. Madison to Greenwish Village. Tranks. The report also underscores the importance of getting the business community to support more funding for public transportation.